I have a meeting this morning at the home of two new clients. I am meeting up with a lighting supplier and we're going to figure out the feasibility of the lighting plan I worked out for a kitchen and great room. The house in question is an early-'90s open floor plan on two floors and the first floor has cathedral ceilings. The house is on the water out at the beach and my task in this case is to bring all of that fifteen-year-old "glamour" into the 21st century. As it stands now, the place looks like a set from "Miami Vice." But I'm planning to make pretty short work of it. Even though the first floor has ceilings that peak at 18 feet above the floor, the builder used ceiling-mounted lighting exclusively. Achieving a sense of scale and intimacy in this warehouse-like first floor is impossible without addressing the lighting. Enter my friends at Tech Lighting (http://www.techlighting.com/). 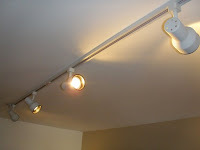 When I proposed using track lighting throughout the rooms of the first floor, my clients weren't exactly responsive to the idea. Like a lot of people, the image conjured up by the phrase "track lighting" sent them back to about 1978 and a space filled with spider plants in macrame plant hangers. The new generation of track lights were pioneered by Tech Lighting and the market is flooded with knock-offs in price points across the spectrum. Tech remains the gold standard of the category. Their products come at a premium, but none of the knock-offs look as good or work as well. Tech calls their track systems "Monorail Lighting" in an attempt to dispel the image of the cover art from Carol King's classic, Tapestry. Monorail tracks are suspended from the ceiling and the tracks themselves are scaled down to the point where they nearly disappear. In suspending the lights (and in the case of a cathedral ceiling, the tracks hang from wires ten feet off the floor) it's possible to imply a ceiling and bring the scale of a room down to something more intimate and human. The other great thing about Tech's Monorail system is the nearly overwhelming number of fixtures that attach to the tracks. In using a Tech Monorail system, I can combine ambient, task and accent lighting in one fell swoop. The effect is terrific and needn't be coldly modern. Tech just introduced a series of drum-shaded pendants that brings a little tradition along for the ride. I love you Tech Lighting!